The Biography of Professor Ukshin Hoti Ukshin Hoti was born in 1943 in Krusha e Madhe, a village in the Municipality of Rahovec, Republic of Kosovo, by the father Nazyf and the mother Fatime, in a family with an average economic condition (father seller of newspapers and mother a housewife). He studied 4 years at the Faculty of Political Sciences in Zagreb, 2 years of post-graduate studies in International Political and Economic Relations in Belgrade, after which he specializes a year in the American universities in Chicago, Harvard – Cambridge, Boston, and Washington D.C. After his discussion in a meeting of the basic party organization of the Faculty of Philosophy, Department of Philosophy and Sociology in Prishtina, on 19 November 1981, he openly stood with the students defending their demonstrations and their fundamental demand for the constitution of Kosovo Republic, was arrested and sentenced for 9 years of imprisonment , which sentence was lowered to 3.5 years by the Supreme Court. In 1990 he involves in Ljubljana (Slovenia) with the journals “Alternativa”, “Republika” as well as with the “Authentic Democracy” which he directs himself as a political creator and as an editor-in-chief. At the beginning of 1993 (March-April) he holds his second political sentence because a year earlier he had organized a massive homage to the martyrs of democracy in Brestovc. In1994 he engages with the Albanian National Unity Party (UNIKOMB). In May 1999, during the NATO bombing his traces were lost. A document was found about his release a day before he was serving his sentence, but this document makes us to suspect that at that time of the “release” the entire Kosovo was in flames, not only his village, but in the entire of his area, the population was expelled from the Kosovo territory and there were only the Kosovo Liberation Army and the Serbian police and military forces. Since then we have no information about him at all. We have asked as a political party, the professor’s family, too, has asked the assistance from the (UNMIK) civilian forces and the (NATO) military forces deployed in Kosovo after the war but we did not find their support. The Serbian regime in Belgrade knows about his fate, but they keep silent, because no one is making pressure to enlighten the fate of Professor Hoti by the internationals. 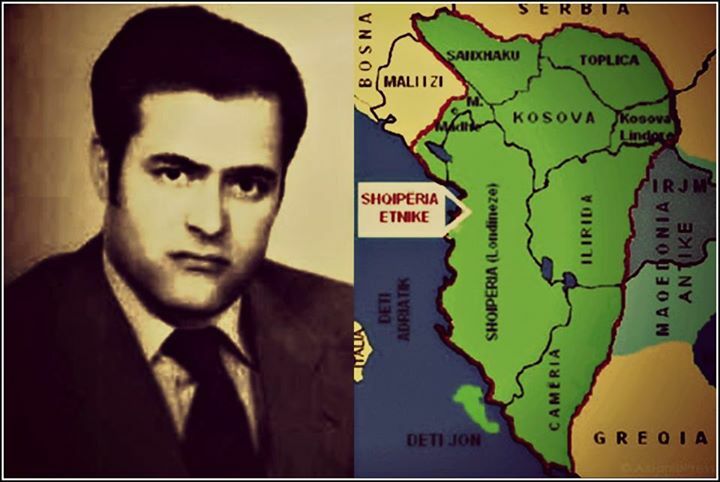 Below I am forwarding you a brief biography and some opinions about the political vision that are summarized in a book: “The Political Philosophy of the Albanian Issue”, (from which book the quotations below were extracted) which will make his life difficult in prisons and will also lose his traces for about 14 years. We hope that you will make the Hoti issue as an international issue. Why will he take over the Leadership of the UNIKOMB As a good expert of national, Serbian, Pan- Serbian and international political circumstances, he will come to the conclusion that “the war could erupt if one still would allow the current trends to deepen the political situation regarding the effectuation of the Republic of Kosovo and with the solution of the Albanian issue as a whole.” Being a missionary and a visionary of the national policy-making in achieving the results without military conflicts, he puts his primary task that: “the emancipation is important for the political science, which should expose the contradiction between the needs of individuals and the existing state order”, because there was no political emancipation by either party in the conflict, but also from the international decision-making centers. He feared of the repetition of the “Albanian Golgotha”, because at the end “People cannot be forced at all to fight due to ideological connotations… and this is natural, since no war in the history was fought for ideological interests, but for those of vital and fundamental. The ideology, usually with less or more success articulates and justifies such interests, but it cannot be substitution for them… Meanwhile, the Serbian chauvinism, hegemonism, etc., were only ideological connotations, behind which something else was hidden. The task was to determine right what that was and based on this determination formulate an adequate policy for Kosovo. In the political platform for the Albanian National Unity Party (UNIKOMB), he will express that the “UNIKOMB-i having been committed for the implementation of these principles (of the self-determination and the nation/state) in the case of Albanians, at the same time helps the advancing of the said processes related to the unification of Europe and with the building of the new international political order.” For these opinions and the commitment to lead this political party, Mr. Ukshin Hoti will be arrested in May 1994 and sentenced for 5 years of close detention. He will in this way reveal the reason of incarceration at the District Court in Prizren “The direct cause of this arrestment certainly was the irrational fear of this part of the Albanian alternative that with my moving to Prishtina at the head of the UNIKOMB after 9 years of ostracism and isolation will disarrange the balance of political forces and create an unpredictable and uncontrollable situation”. The years 1998/99 proved him to be visionary, when the Albanians were forced to take arms, about 15.000 people will be killed and massacred in the most barbaric way of all ages and of both genders, about 20.000 women will be raped, about 90% of family households were set in arson, about 800.000 Albanians will be will expelled from Kosovo and this made NATO to intervene and stop this genocide. The Albanians for a century succession would struggle for a survival. In 1913, Leo Freundlich (a Hebrew from Germany), who, based on the reports of the Balkan wars, draws the conclusion and accused the powers of the time “against ignorance of the new policy, which made it quite openly to the world the resolution: (The Albanians should be eradicated)”. The method of extermination of Albanian nation presents something new in the history of mankind, thus alarming that this issue should be resolved urgently. This issue was forgotten and the alarm for “A wild and an inhumanely soldiery made a havoc, which cannot be described. Thousands of men were massacred, women were raped, old people and children were stifled. Hundreds of villages were set in arson, while Europe was still silent” (from the book: “Albanian Golgotha”). Legend: 1. Blue color represents the Albanian territories on the eve of the Congress of Berlin – 1878, with an area of 115.000 km2, 2. Since that time until 1913, the neighboring countries: Greece, Macedonia, Serbia and Montenegro, with the support of the European ruling states have depopulated violently and effaced the Albanian territories from the geographical map of about 55.000 km2, 3. Albania has 28.000 km2 and is the only country in Europe that from all sides shares borders by its own territories, 4. Kosovo declared its independence supervised by the international Community, on 17 February 2008 and it has an area of over 10.000 km2. About 30% is still occupied by Serbia, by the blame of UNMIK’s own structures and partly by the NATO, although this supervised independence was removed in November of last year.